Cities are a great sign of city achievement. They're huge, filled with people, and hubs of business, which makes it narratively interesting to see them torn down. Fire raining from the sky, buildings collapsing on each other, monsters roaming the streets, and any kitchen sinks left intact being thrown in your face. This trope evokes familiar elements from urban environments like the Big Applesauce with the worst elements of Mordor, often with a Real Place Background. This trope is very often the result of a Monumental Battle, or any urban-centered Alien Invasion. When Apocalypse Anarchy is involved, it may also double as Vice City. If there's a subway, expect a Sinister Subway. As is to be expected, this trope often overlaps with Ghost City, because most of the inhabitants have probably been killed by the environment. Can be a result of Trash the Set, if the city in question was a major setting. Ruins of the Modern Age is closely related, but the ruins don't necessarily have to be urban, and Urban Ruins don't have to exist after society collapsed. A Sister Trope to Urban Hellscape (may not be in ruins, but law and order is long gone), and Industrial Ghetto (also not ruins, but feels like it). In the wake of the Cataclysm event and through Batman: No Man's Land Gotham is reduced to ruins, with nearly every building and bridge suffering structural damage and most of the taller ones having fallen over or been otherwise destroyed. Even after No-Mans Land is over entire sections of the city are condemned and roped off with caution tape, Robin shows that the old opera house in in such a section even though it's only about three blocks from his parents' apartment which is in an area that's being repaired and is bustling with activity. The Day After Tomorrow posits that global warming will cause the Arctic to move up to the point where cities from New York and up are turned into icy wastelands. Emil and the Detectives: The 1964 Disney version is set in the late 1945-early 1946 ruins of Berlin. I Am Legend depicts a post-apocalyptic version of the Big Applesauce which has been overrun by zombie-like creatures. During the massive battle at the end of Man of Steel, Metropolis is reduced to a smoke-filled wasteland for the survivors to straggle around while avoiding collapsing buildings. In the sequel Batman v Superman: Dawn of Justice, the same environment is presented, but from the perspective of a desperate Batman, who sees Superman tear through buildings with his heat vision. Like a lot of blockbusters, the Marvel Cinematic Universe employs this quite a bit. The Avengers enters its climax in this environment. Loki's army of Chitauri have ravaged New York and left most of the city in ruins. Avengers: Age of Ultron doesn't deviate too far from its predecessor. The capital of Sokovia is turned into a flying bomb swarming with Ultron's army of drones. Avengers: Infinity War has Thanos' initial attack on Earth destroy some of Greenwich Village, New York City. Later on, Spider-Man, Iron Man, Doctor Strange, and half of the Guardians of the Galaxy fight Thanos in the ruins of his abandoned homeworld of Titan, which resembles a modern, if alien city. The Hunger Games: Mockingjay reduces the Capitol to this by its second part, between the hundreds of traps the Gamemakers have placed all over the city and the bombings by the rebel insurgency. By the end of X-Men: Apocalypse, Cairo is reduced to rubble thanks to Apocalypse's battle with the X-Men. For the fiftieth anniversary of Doctor Who, "The Day of the Doctor" depicts the capital of Gallifrey as the Daleks begin to destroy the planet. This destruction is what pushes the Doctor pass the Godzilla Threshold and use the Moment to end the war. The Flash (2014) turns Central City into this in "Out of Time," thanks to the Weather Wizard's tidal wave. Supernatural dabbles into this in "The End," when Dean has a vision of the world upon Satan's rise to power. The The Twilight Zone episode "Time Enough At Last" ends in this setting, since the world was destoyed by nuclear war. 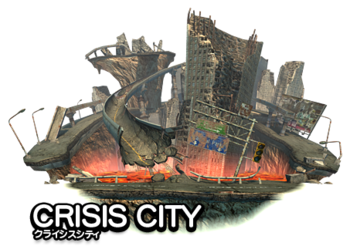 Batman: Arkham City's titular city is a rotting, sequestered part of Gotham that has been fractured by flooding, earthquakes and bombings from the various gangs imprisoned in the City. The entire place is littered with starving criminals fighting over limited food drops. This is especially prominent after Protocol 10 removes a fifth of the population and sets some of the city's landmarks aflame. Batman: Arkham Knight sees the entirety of Gotham City evacuated after a terrorist threat from the Scarecrow, leaving Batman's Rogues Gallery to burn the fire stations, prey on remaining civilians and tear apart Gotham's banks. Not to mention the army of tanks and drones the Arkham Knight sets loose. This is especially prominent after the Scarecrow releases the Cloudburst, blanketing the city streets in Fear gas. The Bad Future of Chrono Trigger is first seen when the heroes have to go through ruins populated with robots, mutants, and giant rats. There is a stretch of abandoned highway clear of debris used as a racetrack by the local gang of robot delinquents. The first level of Contra III: The Alien Wars takes place in a human city which is in the midst of being destroyed by an alien invasion. Decision: Every game takes place in a different city ruined by the Zombie Apocalypse, with broken walls, crashed trucks and dead bodies everywhere. Fortunately, humans manage to fight back by creating fortified enclaves and clearing the zombies out one area at a time. Dishonored. The Steam Punk combined with Diesel Punk city of Dunwall is plagued by a rat plague which kills hundreds of people and leaves Technically Living Zombies in its wake. Many buildings are locked down, ruined, or even completely destroyed. This trope is especially apparent in the Flooded District, which the authorities just gave up on, and so there is not even any order left to be found there. DmC: Devil May Cry's Limbo City is this in general due to its generally crumbing appearance, but it's even more so in its alternate dimension mode, which has demons running around everywhere. The Fallout series has its protagonists visiting the ruins of cities such as Los Angeles, San Francisco, Washington D.C, and Boston. Horizon Zero Dawn has several ruined cities of the Old Ones scattered throughout the game world, including Colorado Springs and Denver among the recognizable ones. The Last of Us takes place in the U.S. after a fungal pandemic wipes out civilization. It takes place in the ruins of several cities, including Boston, Pittsburgh, and Salt Lake City. The last half of Lone Survivor takes place in this after the protagonist finally finds his way out of his apartment. What exactly happened to this City with No Name to start the Zombie Apocalypse is a Riddle for the Ages. The intro level for Megaman X 1 takes place in a city under attack by Mavericks. Wheel Gator's stage in Megaman X 2 takes place in a ship travelling through a half-demolished city. Rebuild takes place in a randomized city of the player's choice (the default is Canadian) overrun by zombies, where buildings can be looted, reclaimed, and converted as needed (into labs, bars, churches, housing, etc.). The first post-tutorial levels of NieR: Automata take place in the urban ruins of the human civilization on Earth, centuries after it had been overrun by robotic alien invaders. The Ultra Ruins in Pokémon Ultra Sun and Ultra Moon are implied to be an alternate version of Hau'oli City ravaged by Guzzlord. Raccoon City of Resident Evil 3: Nemesis. Even before the zombie apocalypse hit, it provided unwilling 'test subjects' for the local Evil, Inc., which practically owned the city and could easily 'disappear' any one of Raccoon's inhabitants. Post-outbreak, it is a grimy bloodstained tangle of streets and buildings that's horrific safety code violations will kill you almost as much as the actual zombies. Thankfully, the ending involves Raccoon City being nuked to high heaven. ''Sheltered is set in the aftermath of a nuclear war, meaning the landscape has plenty of ruined buildings in it. Devil Survivor and its sequel actually take place almost entirely in Tokyo which has been given this treatment through Hell on Earth. Shin Megami Tensei IV also takes place in a ruined Tokyo infested with hostile demons. Starcraft II: Some campaign missions return to Tarsonis, a city deliberately overrun by the Zerg in the first game. Ruined buildings, feral Zerg, and creep are everywhere. Watch_Dogs has the Rossi-Fremont tenement where Iraq and his Viceroys gang have set up shop. At least one building is collapsed and the others are extremely run down. One look makes you surprised that someone actually lives there. XCOM 2's War of the Chosen DLC adds missions set in cities that were abandoned and never rebuilt after the war. They're usually uninhabited, apart from hordes of The Lost. No More Heroes has Speed City, a whole abandoned city where you fight Speed Buster, a homeless old lady with a shopping cart... That turns into a giant Wave Motion Gun. To defeat her, you gotta run towards her, all the while hiding in the ruined, empty buildings to avoid the giant bursts of energy from her cannon, which both deal ridiculous damage AND push you back, making you have to try and run up to her all over again. Homestuck has The Land of Tombs and Krypton, a whole planet covered in green skyscrapers. Problem is, LOTAK is exclusively inhabited by hordes of undead skeletons, who were killed thanks to the fact that the Land's atmosphere consists of obscene levels of toxic krypton. Stand Still, Stay Silent, post-apocalyptic as it is, has the main characters pass through quite a few on their journey; particular attention is paid to what used to be Copenhagen, and Real Place Backgrounds abound. Adventure Time: In the episode "Simon and Marcy," viewers are treated to a flashback of Marceline and Simon Petrikov attempting to survive in the aftermath of a fairly recent apocalypse. Besides the titular two, no humans are seen - only hostile slime creatures, implied to have formed from the same radiation that would later shape the Land of Ooo. In the episode "Come The Conqueror", The Avengers: Earth's Mightiest Heroes! shows a post-apocalyptic version of New York from the forty-first century, thanks to some catastrophe from ten years in the Avengers' future. Justice League invokes this trope twice thanks to fights with Superman. In the finale, the center of Metropolis gets reduced to this after Darkseid lands there and is on the receiving end of Superman's unrestrained power. Over the course of The Legend of Korra's third season following the murder of the Earth Queen by Zaheer, Ba Sing Se collapses into this. The city suffers severe Monumental Damage, the government is torn down, looters immediately start prowling the streets, and fires begin to consume the lower class neighborhoods.